Brittany and Brantley have completed their first week and they are still alive. Not only that, they are not alone. But before we get to that, let’s start at the beginning. With a suit of armor and an empty lot. Add a tent and cooler and it is time to get started. What else does a young couple need? Hmm, is that a special bush in the back corner? Before Brantley takes a job, he wants to make some connections, so he and Brittany plan on completing the Soulmate aspiration. Seven dates, one BFF, 50 romantic gestures each and it is done. 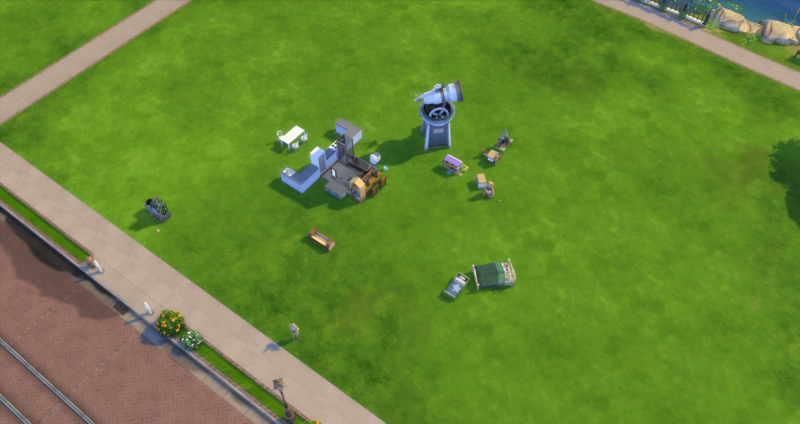 And they have seven gold rewards to sell to help buy a real bathroom with walls. With Soulmate completed for each of them, Brantley purchases Connections and takes a job in the Business career – Management is his goal. Brittany picks up Frugal and begins writing Childrens’ books. 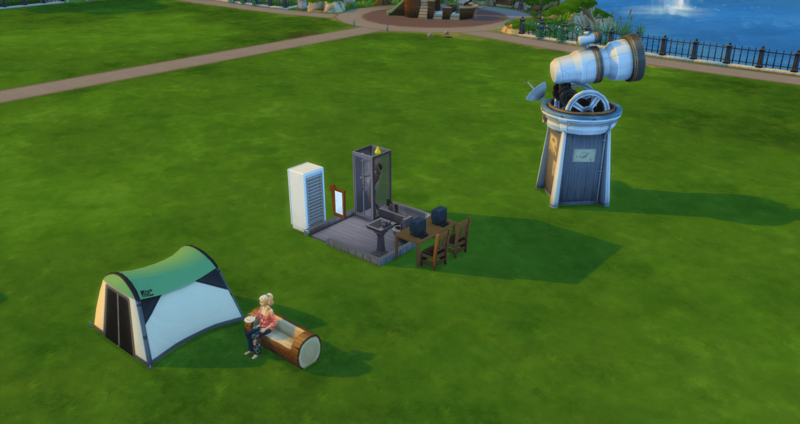 They splurge on an observatory for Brantley’s logic skill as he will get random pictures that they can then sell. I am hoping that works out to make them some money as he gains skill and can start getting the higher value pictures. We’ll see. At the end of Monday, they have a baby on the way, and are settling into their lawn living way of life. Brittany attempts to read up on Parenting but the book just doesn’t keep her interest. She won’t read it for very long so I am thinking she will be learning as she is doing. They really are in a boring stage right now. She writes or takes cares of her needs. He writes reports, works on his charisma or logic, or takes cares of his needs. 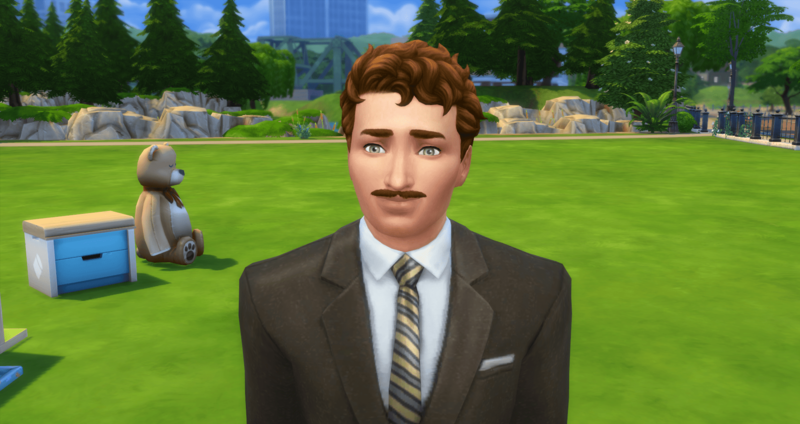 If he could get an extra 3000 aspiration points, I would have him pick up Great Kisser – I hear that it helps level Charisma quickly but he used the points he had earned on Connections and then on Entrepreneurial. 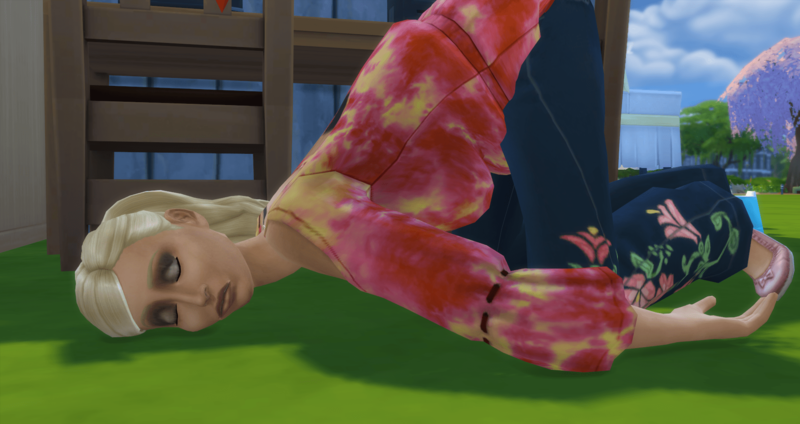 Speaking of needs… Brittany used her aspiration points to purchase Steel Bladder but that doesn’t help her stay awake. By the way, we have had our first boy – this is Bastian. Last night I went to see Shania Twain in concert (awesome) and her opener was Bastian Baker (wonderful). 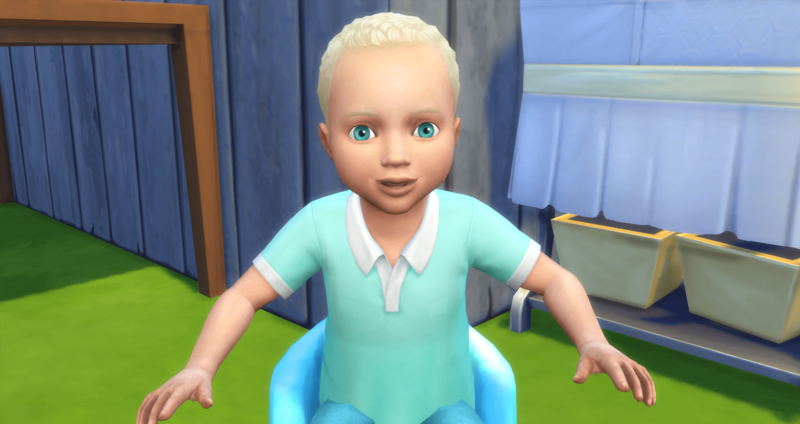 I decided that I would be using Bastian in this challenge and here we go – first baby born. Bastian is Angelic. I will be cycling through the traits rather than rolling – so they will be assigned in order. 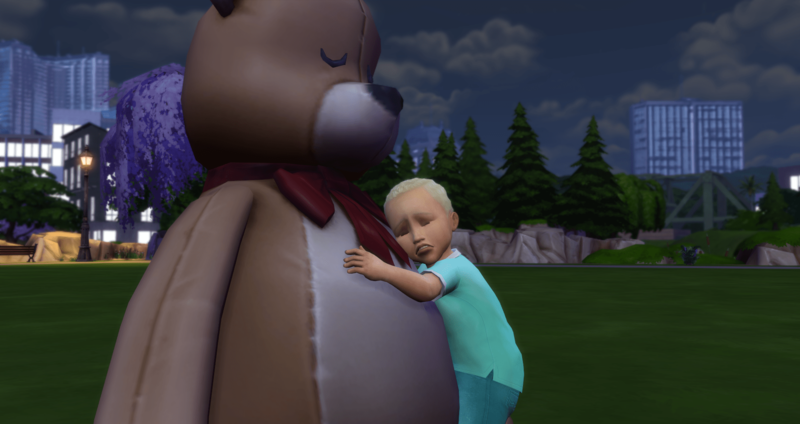 So, I just found out that spamming the stuffed bear is a fairly fast way to level communication for toddlers. This means Potty and Communication skills can definitely (probably) be mastered by all of my toddlers going forward. He is sad because he just mastered potty and had several accidents in the process. The family is still sharing the tent (toddlers can use the tents now) but only two can use the small tent at a time. Brittany needs sleep so she wakes Bastian up. With a hug, of course. I decide it is time to try to get them beds. 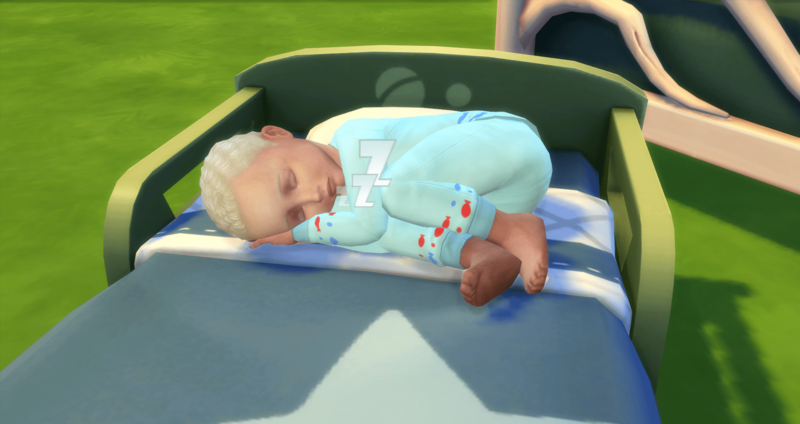 Bastian gets a toddler bed and promptly takes a nap.